Tuesday night, I had the pleasure of attending a workshop held for free at our downtown library. I was there to see Lisa Murphy (aka the Ooey Gooey Lady). If you haven’t seen her or heard of her, you need to check her out! Lisa brings a funny story along with a serious message–KIDS NEED PLAY! AND THEY NEED LOTS OF IT!! We got to watch her make some of her crazy concoctions and talk about the ideas we could use them for in our early childhood classrooms. 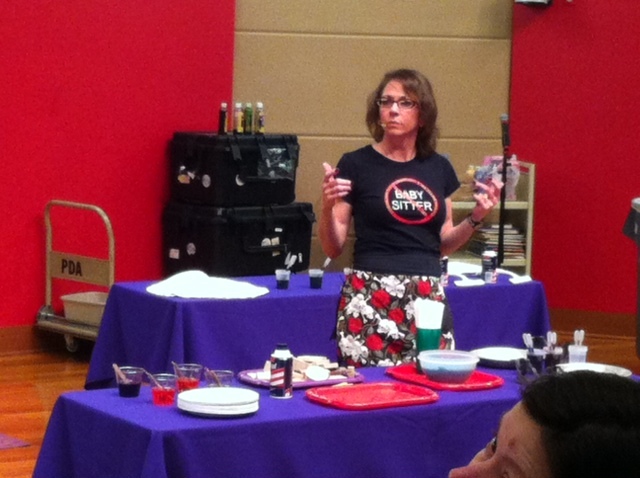 We got to learn about edible paint, cheap musical instruments, and ways to teach young kids about science and Non-Newtonian fluids. Posted on February 28, 2013, in Ooey Gooey, Science. Bookmark the permalink. 2 Comments. Would you recommend any of her books? I thought they all looked good, but wanted to know your opinion! Thanks for all that you share!! !